A frisky fowl thinks the sky is falling in Chicken Little. Featuring the voices of Zach Braff (TV’s Scrubs), Garry Marshall (Race to Witch Mountain), Patrick Stewart (Dune) and Amy Sedaris (The Best and the Brightest), the home 3D debut of Chicken Little is a 3-Disc Blu-ray 3D/Blu-ray/DVD combo pack. The 2005 animated family film offers a fresh version of the well-known children’s story about the titular chicken who fears the sky is falling (not accurate) and that aliens are preparing to invade the Earth (accurate). 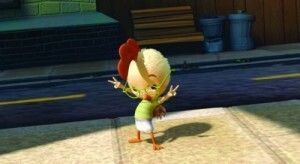 Chicken Little’s Blu-ray 3D contains a number of special features, all of which have appeared on previous releases of the film.